Over the past 16 years Rainbow has provided building solutions for Tasmanians, spanning a huge range of customised garages, sheds, carports and homes. Our professional, experienced and dedicated team share a common goal, to develop and deliver a quality building solution for your individual needs, budget and lifestyle. Rainbow Building Solutions started out as Rainbow Roofing & Garages. A Mum & Dad partnership being Phil & Anita Smith. Phil’s youngest son, Nathan, was employed to help in the manufacture of the garages in our original factory in Austins Ferry. 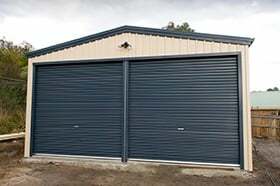 After 12 months of working out of a 6.0m x 6.0m garage, Phil moved the business closer to home to our premises in Sorell. Our custom built factory was constructed along with an office complex. Due to Phil’s hard work and dedication the business grew and Phil decided he needed more help. He then employed his eldest son Matt. Matt assisted in developing the garage market further and with his background in economics, found new and innovative ways of streamlining the business. Due to further expansion and growth in the company, Rainbow then employed Nick, Phil’s second son, to further grow the sales. Not long after that Anita, Matt’s wife started and took over all bookkeeping requirements. Rainbow then opened it’s second site at Kingston. Nick looked after this site and grew the business in the Kingborough and Huon Valley municipalities. With Nick moving office, another staff member was required to help in Sorell. Along came Phil’s third son Josh. Josh assisted with sales in our garage market. After many years of only building sheds & garages, it was obvious our clients were looking for something further. Many of our clients were wanting new homes. Rainbow then expanded in to constructing new homes for these clients. After approximately 12 months, the Smith family were in Brisbane attending a HIA National Awards event. As part of this event a home show was also run. At the home show many different business were being showcased. One of these being Scottsdale Steel Framing. Scottsdale manufactured rollformers that produce prefabricated steel wall frames and roof trusses for the domestic housing market. Phil & Matt were so impressed that they decided to purchase a wall frame machine. Rainbow continues to use the same original machine today and have now added a truss rollformer to their arsenal of construction equipment. Rainbow are the only Tasmanian company that manufactures and installs their own steel roof trusses. Rainbow has further expanded our capabilities with the opening of our third branch in Kings Meadows. This office services Launceston, North West and North East areas of Tasmania. Rainbow’s housing expansion has seen more developments in the number of staff employed by this Tasmanian owned family business. We now employ 6 carpenters, 1 project manager, 1 full time dedicated housing consultant, 2 factory & delivery staff, 3 administration staff and 4 garage salesman. Support Tasmania owned and operated businesses. Call 1300 737 910 to discuss your building requirements.